Riding high with the right answer was Susan. We're off to Manchester this week and a statute of the 16th president of the United States. My apologies for the angle of the photograph but building works meant that the space in front of the statue fenced off. His early life gave no hints to his political ambitions or the lasting legacy he would leave behind. He was born in 1809 in a one-room log cabin in Kentucky. When he was seven years old his family moved to Illinois and he spent much of his younger life moving around and taking on jobs such as a shopkeeper, post master and working on a river boat on the Mississippi. At the age of 25 his growing interest in politics saw him winning election to the Illinois state legislature. He was a self taught lawyer who after passing the necessary exams was called to the bar in 1836. During his time as a working lawyer he continued to further his political career and was elected to the US House of Representatives in 1846. He held strong opinions on many national matters which at times was not always the populist view. He was against the US war with Mexico and opposed slavery. His strong performances in debates led him to be given the nomination as the Republican candidate for the presidency. Despite his unpopularity in the southern states he secures enough votes to become president in 1860. His election saw the breakaway of seven southern states to form the Confederate States of America. In turn this became the America Civil War. As the war raged on the president travelled to Gettysburg to the dedication of the Soldiers' National Cemetery. There he gave a speech that was only 271 words but has become one of the most famous in world history. We were joined last week by Susan and some leaf collecting. Minoru has been to Mt. Kuradake. Sara favourite things this week include magnolia blossom with bud, the Volunteer Park Conservatory in Seattle and a rose bouquet from the garden. In New Zealand Betty paid a visit to Tupare Garden. Paying a flying visit to Cheryl was a one-footed seagull. A trip to Manchester for Kara meant seeing the Blue Peter studio and the Wave and Weeping Poppies. Finally, Jesh has been to the Netherlands. If you want to join in with this week's Sunday Snap then add your link to the linky below. Any theme is allowed. It doesn't have to be published today as you have until 23.55 on Friday 5th October 2018 to join in. Grab my badge below for your blog post. Just make sure it is your photo and you hold the copyright for it. Abraham Lincoln. 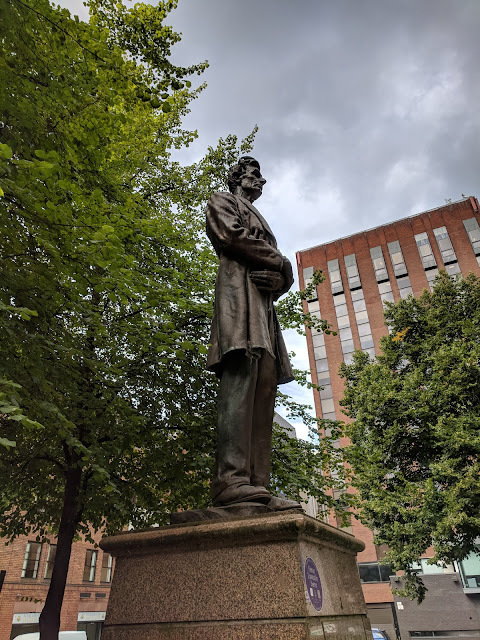 I had no idea there is a statue of him in Manchester. I think the angle of the photograph is great! I think it's Abraham Lincoln. Abraham Lincoln, but why is there a statues of him in Manchester? "OF THE PEOPLE, BY THE PEOPLE, FOR THE PEOPLE" His speech is very famous in our country. I was in Manchester just before the terroism happened in last year. Thanks for sharing.